ShopRunner is a membership service that offers express shipping and other benefits for a subscription fee of $8.95 per month, or $79 per year. That’s less than the price of Amazon Prime, which it seems that they’re trying to compete with. ShopRunner works at hundreds of stores, for thousands of brands, and for millions of products. While Amazon requires you to shop directly through their site, ShopRunner lets you shop through many of their partner sites, and then you have the option of using your ShopRunner membership for free shipping. For several years it has been possible to get a free ShopRunner membership for having any American Express issued credit card issued in the US. Yes, even a no annual fee Amex card gets you a free ShopRunner membership, which is a great perk. Originally this was introduced as a perk you’d get for one year, while now you can get it on an ongoing basis. Well, it looks like Mastercard is now offering the same benefit. 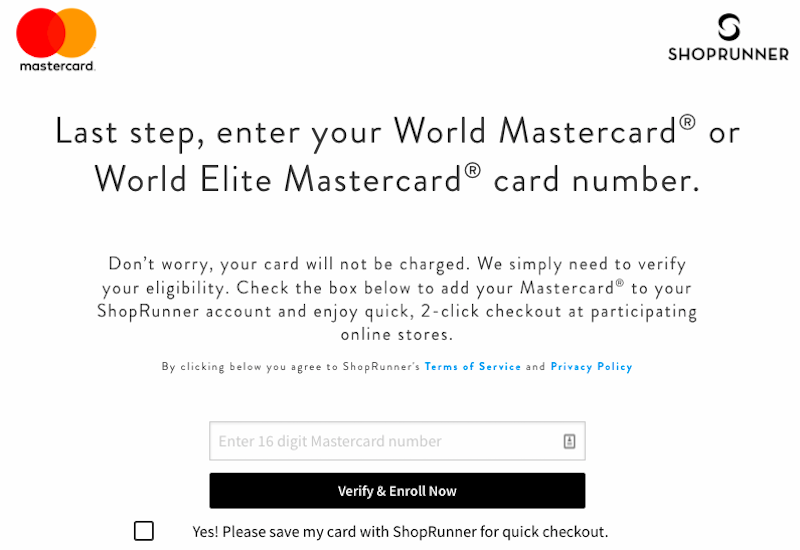 Those with a World Mastercard or World Elite Mastercard product can now receive a free ShopRunner membership. A vast majority of Mastercards issued in the US are “World” or “World Elite,” so this includes cards like the Citi Premier℠ Card, Citi® Double Cash Card, Citi® / AAdvantage® Executive World Elite™ Mastercard®, Citi® / AAdvantage® Platinum Select® World Elite™ Mastercard®, etc. At this point I suspect a vast majority of you based in the US should be eligible for a free ShopRunner membership. The process of registering is super easy. You’ll just be asked to enter your name and email address, and then to enter your credit card number for verification purposes, at which point you should be good to go. I’ve used ShopRunner a few times, though at the end of the day I use Amazon more than anything else. Now if only a credit card offered a free Amazon Prime membership. To those who are ShopRunner members, how do you feel about the service? You can get one clothing item and you still get free shipping.